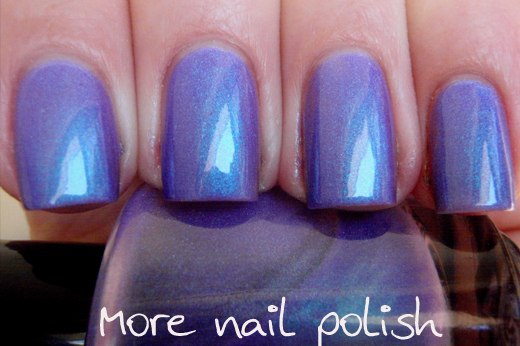 Here is the third polish that I received to review from Annette at Shoppe Eclecticco in Singapore. I had heard of indie brand Elixir Lacquers before, but not tried any of their shades. This shade has the more adorable name: Miss Kitty's Mee-Yow. 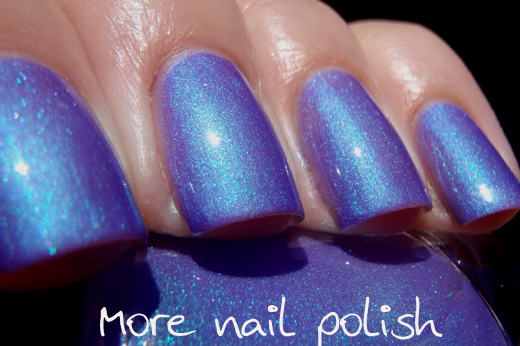 Miss Kitty's Mee-Yow is a lavender purple base with a rich aqua blue shimmer. 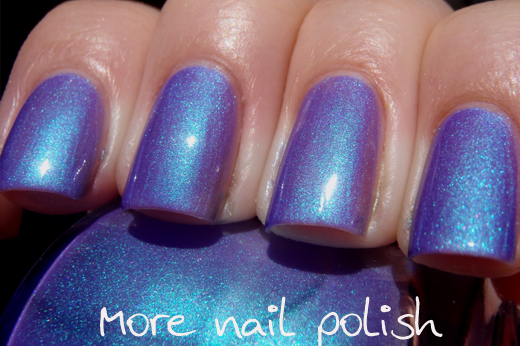 Because of the contrasting base colour and shimmer this really takes on a duo chrome feel where the sides of the nails look very purple, but where the light reflects it looks blue. Application was good and it wasn't streaky despite the strong shimmer. 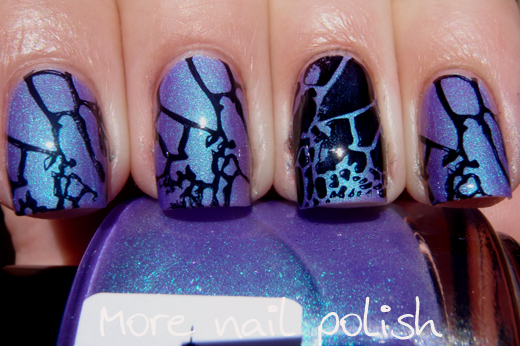 I used three coats here with Seche Vite top coat. Gorgeous. I also thought I would try some stamping on this polish, I liked it, but thought the black was probably a bit harsh on top of such a pretty and delicate shade. This is your last change to enter my giveaway sponsored by Shoppe Eclecticco. I closes in less than two days. Apart from the chance to win some great prizes, its a great idea to sign up for or follow Shoppe Eclecticco, cause soon they will be stocking three amazing Aussie indie brands (Emily de Molly, Gloss n Sparkle and Femme Fatale Cosmetics). And they ship internationally! That looks so beautiful on you!!!!! I tried for an hour to get a ‘followgram’ name to follow ‘Shoppe Electicco’ which was the last thing I needed to do to get 6/6 & complete all that was required for the Competition & got to the point where I had to give up or lose my sanity - but it gave me the chance to check her site out anyway & start a cart before realising - I should wait just in case I'm lucky this time in your competition & if not will go back soon & try some of hr Fab looking stock to play with. Thanks for “YOUR” ‘FAB NAIL BLOG’ & also giving us not so experienced the heads up before we lose our money or sanity on all the new types/styles of nail polish/varnish or lacquer, nail strips or stickers, magnets & stamping. I enjoy your Blogs each Day & adding my Favourite colours & finishes to my 'Nail' Pin board & I hope it's bringing you more Blog traffic too as your designs do get either re-pinned or liked from my board quite a lot! Thanks for the chance to win & Good Luck to everyone else that enters too!